Group Visits at Cwrt Bleddyn Hotel & Spa01633 450521work Group AccommodationA group booking would consist of 10 or more rooms, but we can look at any special requests. We have 15 twin rooms at the hotel. We have free car parking, which is suitable for a coach and guests also have access for free Wi-Fi and use of the hotel leisure facilities, indoor pool, gym, Jacuzzi, steam room and sauna. We also have a Spa at the hotel so subject to availability can look at packages including treatments. The Ramada Resort has a rural location but easy access to M4. Part of the hotel dates back to Tudor times and we have 46 bedrooms in total. 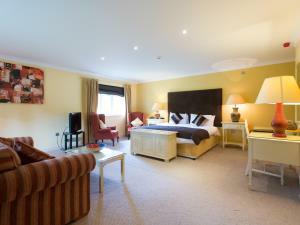 We can offer bed and breakfast or dinner bed and breakfast rates and private dining for groups. We also have a large event room which can seat 170 and is licensed for 200 for a buffet, so would be suitable for a group looking for a dinner dance. A group booking would consist of 10 or more rooms, but we can look at any special requests. We have 15 twin rooms at the hotel.